The most catastrophic ladder accidents are caused by over-reaching, working on uneven surfaces, and stepping from the ladder to the roof and back. People have attempted to solve the leveling problem with rocks and boards and are left to improvise, or do nothing. To be precise: the HyperLite SumoStance, with the added safety of leveling outriggers, is still lighter than any other traditional extension ladder without sacrificing strength and stability. 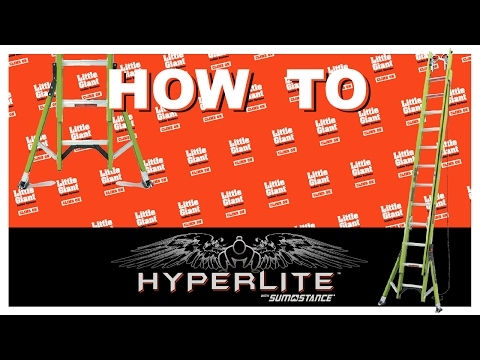 The HyperLite SumoStance also offers a side-to-side bubble level and front-to-back angle indicator, making it possible to set up the ladder safely. It also features Little Giant’s unique side-mounted, dual-pulley system, which reduces the effort required to lift the fly section by 45% and removes the potential trip hazard caused by traditional center pulley rope systems. Its wide rungs let you work comfortably without foot fatigue. The patent-pending Sure-Set™ foot allows you to set the feet in either flat or spike positions and have them stay in place. Little Giant’s exclusive nonconductive hi-viz green rail has been scientifically proven to be the most visible hue of the color spectrum to the human eye. Why should a ladder need to be hi-viz? Some of the most catastrophic falls are caused by people who walk or drive into an extension ladder in use. People die simply because the ladder was not visible. Weight Capacitiy 300 lbs. 375 lbs. 300 lbs. 375 lbs. 300 lbs. 375 lbs. 300 lbs. 375 lbs. 300 lbs. 375 lbs. 300 lbs. 300 lbs. Extension Min. Height 9 ft. 9 ft. 11 ft. 11 ft. 13 ft. 13 ft. 15 ft. 15 ft. 16 ft. 16 ft. 18 ft. 20 ft.
Extension Max Height 14 ft. 14 ft. 18 ft. 18 ft. 22 ft. 22 ft. 26 ft. 26 ft. 30 ft. 30 ft. 33 ft. 36 ft.
Extension Max. Highest Standing Level 9 ft. 6 in. 9 ft. 6 in. 13 ft. 3 in. 13 ft. 3 in. 17 ft. 1 in. 17 ft. 1 in. 20 ft. 10 in. 20 ft. 10 in. 24 ft. 10 in. 24 ft. 10 in. 27 ft. 8 in. 30 ft. 6 in. Storage Height 8 ft. 7.5 in. 8 ft. 7.5 in. 10 ft. 7.5 in. 10 ft. 7.5 in. 12 ft. 7 in. 12 ft. 7 in. 14 ft. 6.5 in. 14 ft. 6.5 in. 16 ft. 6 in. 16 ft. 6 in. 18 ft. 5 in. 20 ft. 4.5 in. Storage Width at Base 1 ft. 10.5 in. 1 ft. 10.5 in. 1 ft. 10.5 in. 1 ft. 10.5 in. 1 ft. 10.5 in. 1 ft. 10.5 in. 1 ft. 10.5 in. 1 ft. 10.5 in. 1 ft. 10.5 in. 1 ft. 10.5 in. 1 ft. 10.5 in. Storage Depth 6 in. 6 in. 6 in. 6 in. 6 in. 6 in. 6 in. 6 in. 6 in. 6 in. 6 in. 6 in. Rung Size Double Section 4 in. 4 in. 4 in. 4 in. 4 in. 4 in. 4 in. 4 in. 4 in. 4 in. 4 in. 4 in. Total Leveling Adjustment 8 in. 8 in. 8 in. 8 in. 8 in. 8 in. 8 in. 8 in. 8 in. 8 in. 8 in. 8 in. Leveling Increment 3/8 in. 3/8 in. 3/8 in. 3/8 in. 3/8 in. 3/8 in. 3/8 in. 3/8 in. 3/8 in. 3/8 in. 3/8 in. 3/8 in. Max Base Width 3 ft. 9 in. 3 ft. 9 in. 3 ft. 9 in. 3 ft. 9 in. 3 ft. 9 in. 3 ft. 9 in. 3 ft. 9 in. 3 ft. 9 in. 3 ft. 9 in 3 ft. 9 in. 3 ft. 9 in. 3 ft. 9 in. Ladder Weight 38.6 lbs. 39 lbs. 38 lbs. 46 lbs. 51 lbs. 52 lbs. 57 lbs. 59 lbs. 61 lbs. 69 lbs. 74 lbs. 81 lbs. W/Cable Hooks & V-Rung 43.2 lbs. 43.6 lbs. 49.9 lbs. 50.6 lbs. 55.8 lbs. 56.6 lbs. 62.8 lbs. 63.6 lbs. 66 lbs. 73.6 lbs. 81 lbs. 89 lbs.